When it comes to driving special cars on unconventional tracks, race courses and performing podium placements, not every car driver has the knack to step on the gas and exercise maximum control over his or her four-wheel automobile at breakneck speed. But for someone like Tanner Foust, it is what he lives and sleeps on, for which reason the pro- driver has come to be famous all over the world. He is a champion of champions from many contests and one of the strongest hands on the wheels of any race car you can think of. Here, you will learn all about him in addition to the unknown details about his wife and daughter. He is an American professional race and stunt driver who competes in drift and ice racing, rallies, rallycross as well as time attacks. Sometimes, when he is not seating behind a steering, Tanner Foust could be found co-hosting the television series titled, Top Gear. Over the course of his decade-long motor career, he has won many races and amassed an enviable list of achievements, this has stood Tanner out as a role model for many young drivers hoping to make a career out of his line of profession. The high points of his career on race tracks, rallies, drifting and in performing stunts include his winning of the 2005 Rally America PGT Champion Flatirons Tuning 429 WRX], 2008 Race of Champions Competitor, 2010 Formula Drift Silver Medalist [Rockstar-Scion Scion TC], 2012 World Record for Largest Loop-the-Loop in a car (60 feet in diameter) and 2013 X Games Los Angeles RallyCross SIlver Medalist [Rockstar Energy Ford Fiesta ST], to mention just a few. 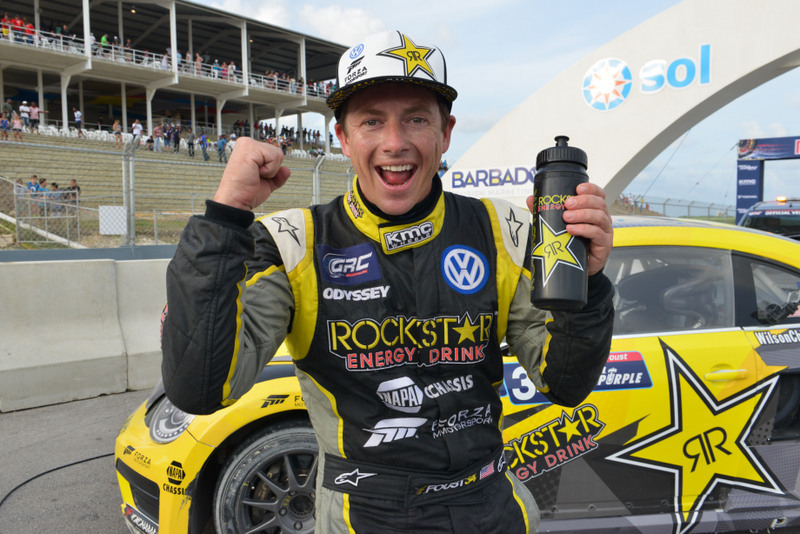 While Tanner Foust was having the time of his life competing and winning races against other drivers, he was also building a career in the television and film industry as it pertains to his motoring interest. Notably, the professional driver featured in The Dukes of Hazzard (2005) as a stunt driver, he voiced Jet the Hawk in Sonic X: The Final Stand (2011), starred in Hitman: Agent 47 (2015) as a hitman stunt driver and was equally on Need for Speed (2014) and Straight Outta Compton (2015) both as a stunt driver. Though we know the driving champ’s life to be decorated with many career successes, not much has been revealed about his background, but here, we got you covered. Tanner Foust was born on the 13th day of June 1973 in Los Angeles, California to Dave Foust and Jane Foust. His dad was a naval officer and thus he spent his childhood in Scotland where their family resided at the time. The lad had his basic education there before returning to the United States. While he was still in Scotland, Tanner took a liking to cars and learned how to drive on the country road near his home. This passion he developed for cars would later serve him to be what he carved a career out of. On his return to the US, Foust enrolled at the University of Colorado where he earned a degree in molecular biology. After college, the prospective professional driver started off as an ice driving coach, later he worked as an instructor at automotive marketing events and competed at times in races and drifting. By the year 2003, he went pro and relocated to California which was more suited to further his career. Tanner Foust began featuring in Hollywood films as a stunt driver. As he appeared on films, he equally raced on tracks against renowned drivers like Sebastian Vettel, Michael Schumacher, and many others. Still in line with his passion for cars and racing in addition to having got screen time on a couple of Hollywood blockbusters, the Los Angeles born driver began working as a co-host of Top Gear on NBC in 2010. Due to his impressive performance on set, Tanner also had gigs in hosting other television shows like RM Classic Car Auction (2007), SuperCars Exposed (2008–2009) and many others. No doubt, his career is still on the rise and more will still come from him both on the track and on screen. On the family side of things, Tanner Foust surprised a whole lot of people when they learned he had a daughter. To further dumbfound us, no word was said about who the little girl’s mom is neither did any woman come forward to claim to be her mom. The relationship between the father and daughter has remained warm for years now and she has grown into a teenager. See Also: Matt Kenseth Wife, Age, Children, Net Worth, When Is He Retiring? On the other hand, the driver who is synonymous with speed is reportedly dating Fox Sports reporter Katie Osborne. Some reports claim they are both married but we haven’t ascertained that. However, what we know is that Tanner and his girlfriend Osborne are both living together with no breakup rumors hovering over them. The professional race driver, drifter and stunt performer stands a height of 1.78 m or 5 feet 8 inches. His is a career where height is not of priority.